One of the famous festivals in China is Dragon Boat festival (端午節). This festival commemorates the patriotic poet Qu Yuan (屈原) who died on the fifth day of the fifth month in the Chinese lunar calendar. Like other Chinese festivals, there is also a legend behind it. You can read the long story online and learn why Dragon boat racing and eating Zongzi have become the central customs of the festival. This year, the festival falls on June 12 and I can see a lot of Chinese people at the market getting ingredients to make Zongzi. 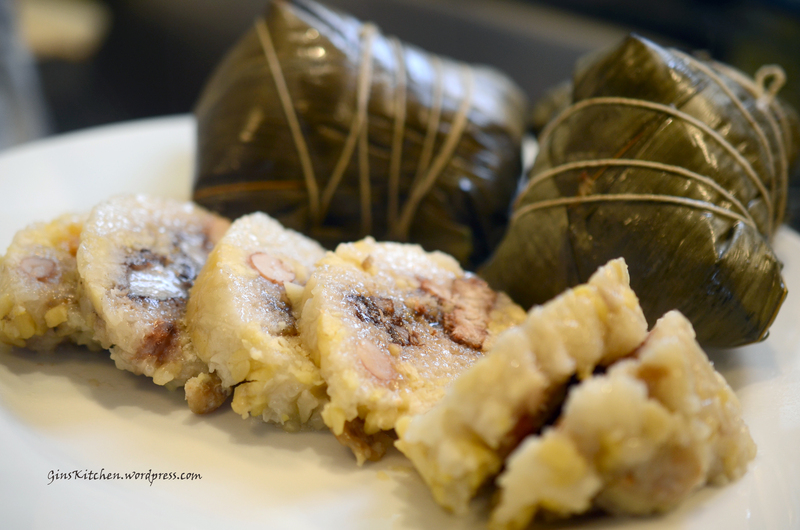 Zongzi (also called Zong) has different shapes and various fillings and the main ingredients are sticky rice, green beans, fresh meat and salted duck egg yolk. 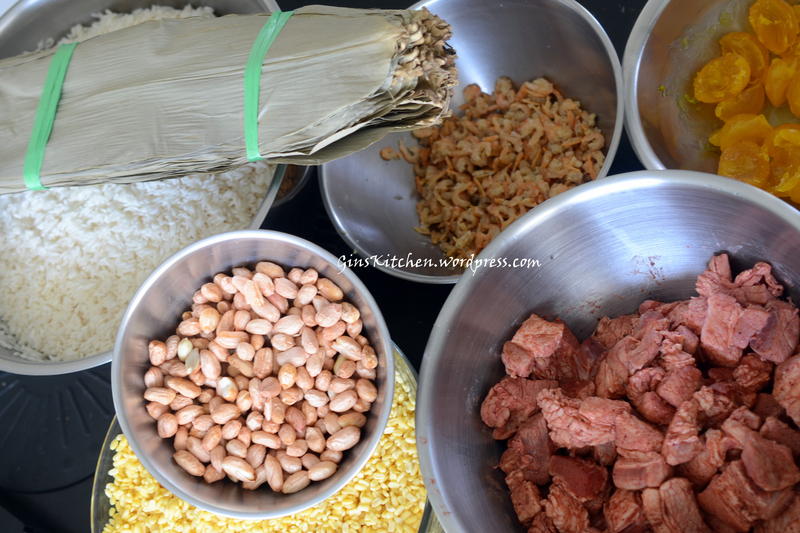 People also added red beans, dried shrimp, peanuts, chestnuts, Chinese sausages, shiitake mushrooms etc. 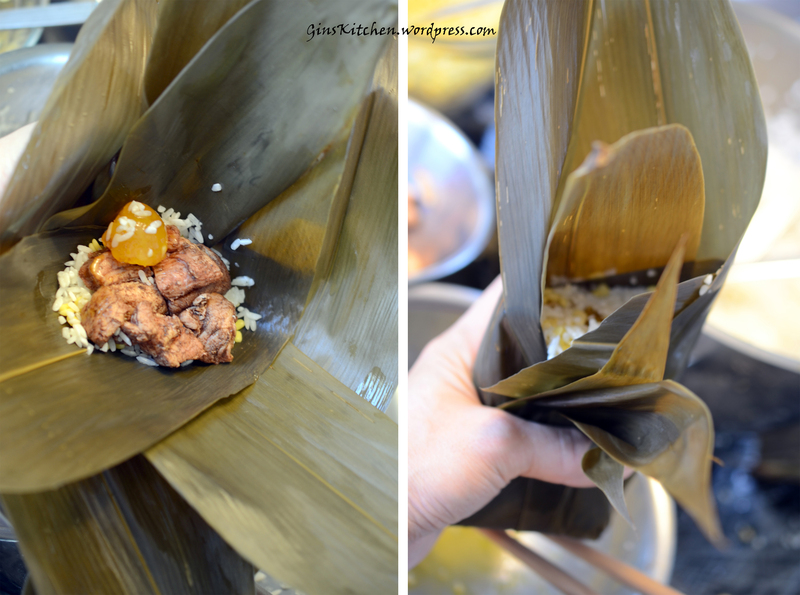 I have made these Zongzi for many years (only once a year though) and I’m sharing my mom’s secret recipe today. Every year she makes a lot and gives them to friends, relatives and neighbours. Her Zongzi were fabulous and never disappointed anyone! Cut pork belly into approx. 1.5” cubes and marinate with 1 teaspoon of salt for 20 minutes. In a small bowl, mash the red fermented beancurd and add light soy sauce and water, mix well. Heat the wok with 1 tablespoon of oil and stir in the beancurd mixture, add pork belly and stir fry until the meat gets a nice coat of the sauce – about 5 minutes (the meat is not completely cooked). When the meat is cool, cover and refrigerate overnight. After the meat is marinated overnight, take it out from the fridge, roughly rinse off the beancurd mixture and pad dry. Sprinkle about 4 tablespoons of five spice powder and mix well. The pork pieces should have a nice coat of powder, add more if necessary. Set aside. Soak rice in water for 4 hours, drain. Add 3 ½ tablespoons of salt and 6 tablespoons of oil to the rice, mix well (taste the rice, add more salt if necessary). Set aside. Soak Green mung beans in water for 2 hours, drain and set aside. Wash dried shrimp, pad dry and set aside. Boil a pot of hot water and put the bamboo leaves in, soak for 20 minutes. Wash each one with a brush. Wrap ingredients with bamboo leaves (see instructions below). Boil Zongzi for 4 hours. If leaves are very dirty, you may want to use a clean brush to brush each leaf. After washing and boiling the bamboo leaves, choose two large ones, make a small cross with the leaves. Bend and twist the leaves in the center to make a funnel shape (see pictures below). Now you fold the top leaf flap downwards to make a package. 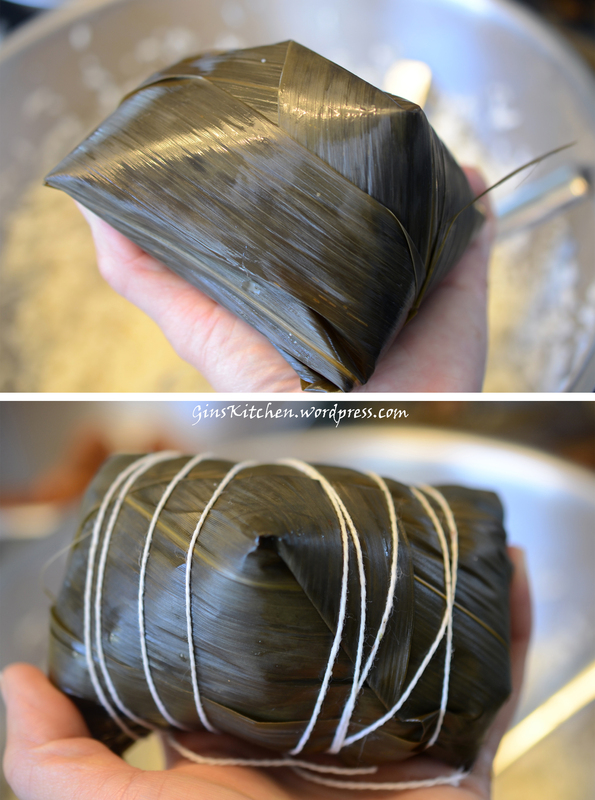 Take a long string and wrap the Zongzi firmly. 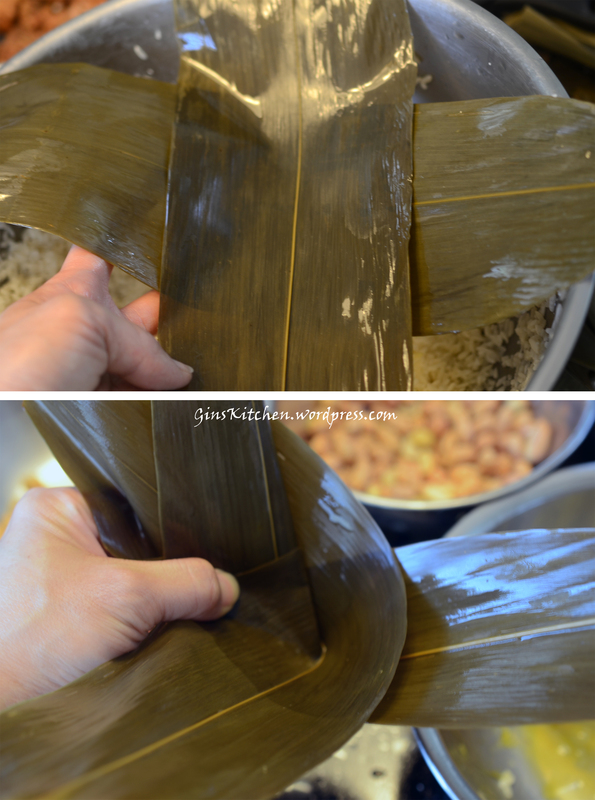 Place Zongzi in a large pot and fill the pot with water (water should cover all Zongzi), cover and bring it to a boil. Reduce heat and cook for four hours. You will need to check the water level, add water as necessary. The pork belly should have some fat, do not trim the fat. The meat will be too dry if it’s all lean. I left one ingredient out (紅絲線 aka 紅藍) which is Chinese herb. I just couldn’t find it in the States, probably sold in Asia only. Turnip cake is my husband’s favorite dim sum dish which can be found in Chinese dim sum restaurants throughout the year. Turnip cake is traditionally made during the Chinese New Year since turnip is a homophone for “good fortune”, so people would make 10 plus containers and give them to friends and relatives. The difference between homemade one and restaurant one is the amount of filling. Even you find an authentic Chinese dim sum restaurant, you still won’t be satisfied with the filling (quite stingy). This recipe requires a lot of chopping, but you will appreciate every effort you put on making this. In a large bowl, shred turnip with a grater or you can use a food processor. Separate turnip liquid and grated turnip. You should have about 2½ cups of liquid, if not, add water to make 2½ cups. Save about 550g of grated turnip for later use. Soak shiitake mushrooms until softened. Squeeze the mushrooms to drain all water. Chop and set aside. Soak dried scallops until softened, reserve the water for later use, chop and set aside. 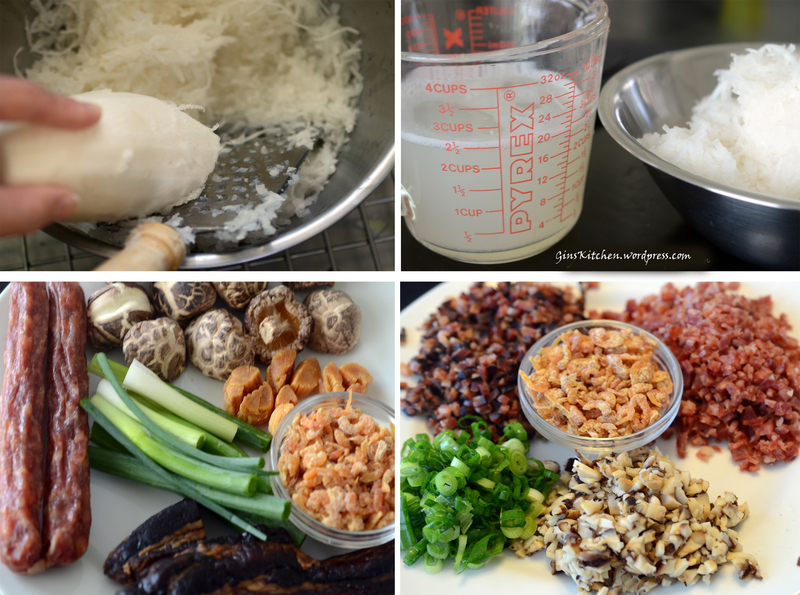 Rinse all ingredients, chop Chinese sausage, bacon, dried shrimp and green onion, set aside. In a large mixing bowl, combine the rice flour, cornstarch and turnip liquid, stir with a spatula until well blended. Combine chopped sausage, bacon, dried shrimp, mushrooms and scallops in a large bowl and marinate with soy sauce, sugar and cooking wine. Add 1 tablespoon of oil to a frying pan, stir fry for 2 minutes. Set aside. Add two tablespoons of oil and a clove of garlic to a large skillet, when garlic turns slightly brown, discard garlic and pour grated turnip into the skillet, stir fry for 2 minutes and add in chicken broth, liquid saved from soaking dried scallops, chicken powder, salt, sugar and pepper, mix well. Cover and cook for 5 minutes over medium low heat. After 5 minutes, add ingredients listed in item 6 to the skillet, stir fry until everything is combined. Gradually add liquid mixture and chopped green onion to the pan and mix well. Transfer the batter to two 8-inch pie pans. Steam the batter for 40 minutes over medium high heat. The most common way to eat this turnip cake is to slice to 3/4″ thick pieces and pan fry until both sides are golden brown. Served with hot sauce. Mantou are originating from Northern China. These buns are soft and fluffy in texture, pretty plain in taste, not sure if everyone will like it but I’m a big fan. I like to eat them fresh straight after steaming (plain) or deep fry them. You can also give it a little sweet flavor by dipping in condensed milk. In a small bowl, dissolve dried yeast in warm water. 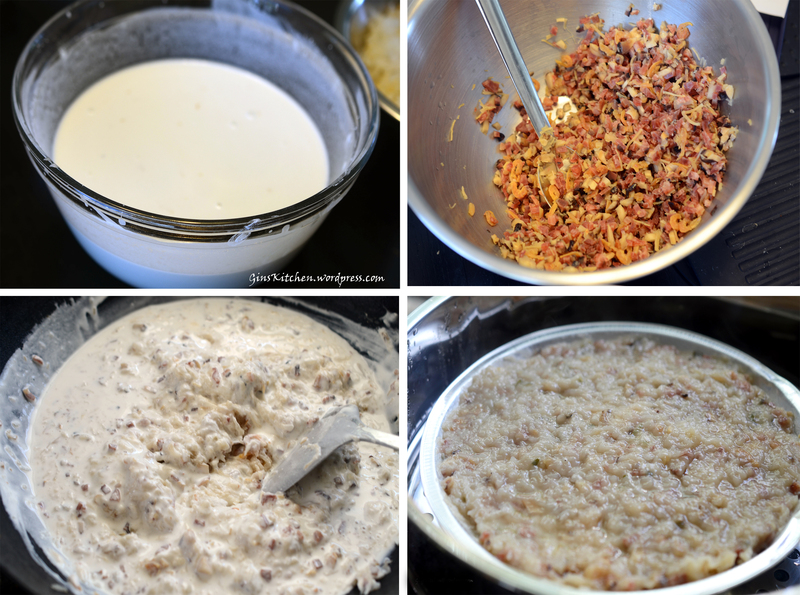 Combine all ingredients in a mixing bowl, attach the dough hook and mix the ingredients with low speed. Knead the dough until it’s smooth, around 10 minutes. Let the dough rest for 10 minutes. Dust a clean work surface lightly with flour, roll out the dough to a 25” x 6” rectangle. Fold it into thirds and roll it out again to approx. 17” x 10” rectangle. Brush the surface with water. Roll the dough tightly from the longer edge to form a log. Cut the log into half and cut out 4 even pieces from each log. Prepare 8 square pieces of parchment paper, slightly larger than the bun. Put parchment paper under each bun. Place buns in a large steamer (most steamers have multi layers), pour some cold water in the bottom of the steamer, cover and let the buns rise for 20 minutes. 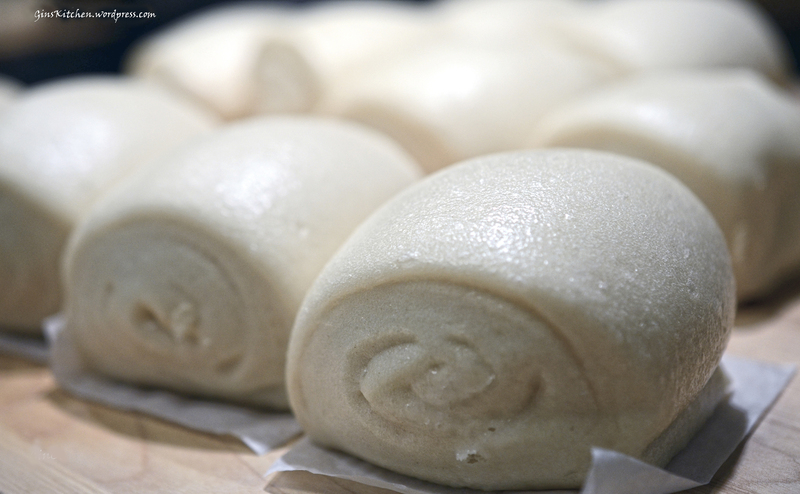 After the final rise, steam the buns for 20 minutes until they are cooked and puffed. If not eaten immediately, they can be stored in the freezer for up to 3 months. Reheat them in a steamer for 5 minutes after removing them from the freezer. 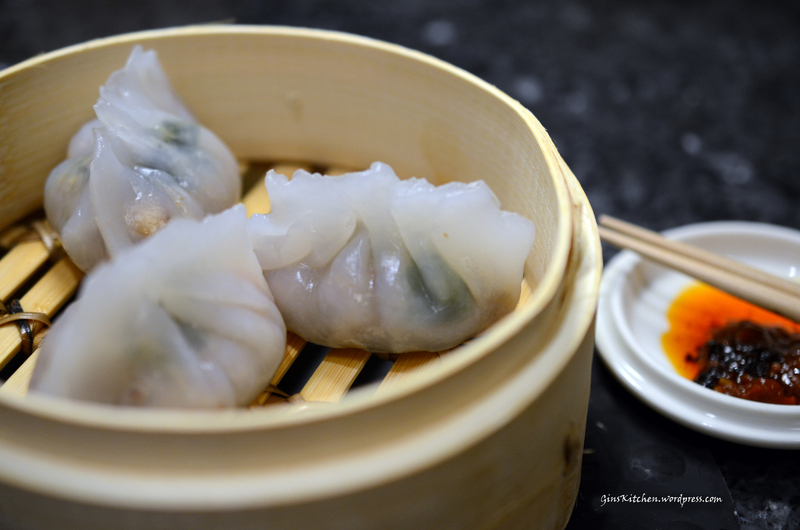 These Chiu Chow-style steamed dumplings are very pupular at Chinese dim sum restaurants. My grandma made the best Fun Gor, I regret I did not ask for her secret recipe when she was alive. However, I was able to gather pieces from relatives, friends and online. It was a fun process to experiment with ingredients until the recipe was just right. Dice all ingredients, set aside. Add 2 tablespoons of oil to a pan and fry the dried shrimps, set aside. Boil some water and cook the prawns (about 2 mins), cut each prawn into 3-4 pieces, set aside. Add 1 tablespoon of oil and heat the pan/wok with a glove of garlic, pan fry jicama, mushrooms, carrots and celery, set aside. Marinade the meat and pan fry until it is cooked, add all ingredients listed in 4. Add in ¼ cup of chicken broth and simmer for 3-5 mins with low fire. Stir in the seasoning mixture to thicken the filling. Set aside to cool down. Stir in ground roasted peanuts and mix well. Add a pinch of salt into wheat starch. Boil 250ml of water and pour into the wheat starch, mix quickly. Add Tapioca starch a little by little while kneading the dough. Add a little oil and keep kneading. Cut the dough into 16 pieces, cover with a cloth to keep warm while wrapping the dumplings. Take out one piece of dough at a time, use a rolling pin to roll the dough into a flat circle, or you can use a plate to press it down to form a circle (a tortilla press would have been ideal for this). Scope a spoon full of filling and add some roasted peanuts, prawn and cilantro into the wrapper. Fold the wrapper in half and seal the edges. Spray cooking oil on the steamer and steam dumplings for 7 minutes. When cooked, the skin will turn transparent like crystal. Note: Tapioca starch gives it more elasticity. If you want a chewer skin, you can change the recipe to have equal amount of wheat starch and tapioca starch. When I lived in Hong Kong, these egg tarts were one of my favorites, they were my breakfast, lunch or afternoon snack. 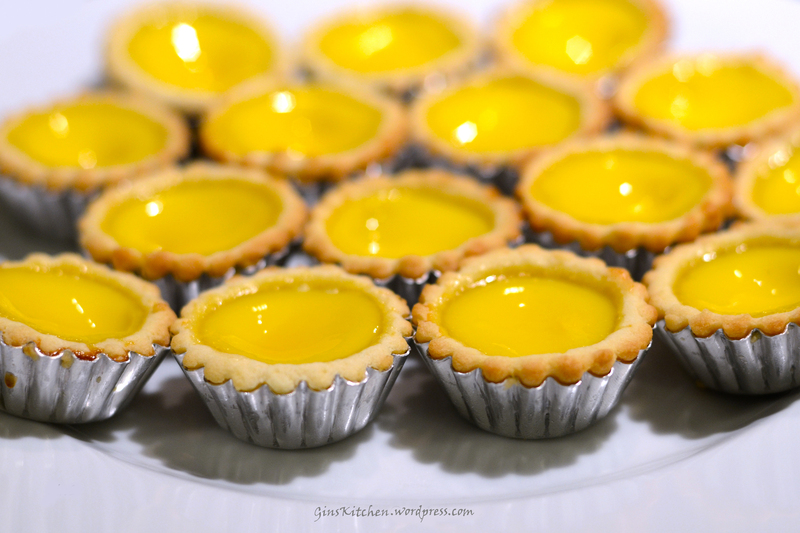 You will find these tarts on the dim sum menu if you go to a Chinese dim sum restaurant. Traditionally, the crust is made with lard (no kidding, you know how unhealthy it is!). With the homemade egg tarts, lard can be substituted for butter. Recipe was dapted from Christine Ho’s blog – Cantonese Egg Tarts recipe. I slightly adjusted the sugar amount from the original recipe to suit my taste. Place softened butter and sugar in mixer bowl, attach bowl and flat beater, turn to medium speed and beat until the mixture is smooth. Add in whisked egg and vanilla extract, beat over low speed. Sift in flour in two batches, turn speed to “stir” to mix, scrape down the sides with a spatula, then sift in the remaining flour, turn speed to stir to mix well. Take out a piece of dough (size of a quarter) and put it in the middle of the tart tin. Work from the center, push the dough outward with your thumb, trim away any excess dough. Or you can roll out the dough and use cookie cutter to cut a circle. Add sugar into hot water (not boiling water), mix until completely dissolved. In a medium bowl, mix whisked egg and evaporated milk, pour in sugar water. Sift egg mixture with a strainer/sifter (do not skip this step as it will isolate stringy white pieces in egg white or foam). Pour egg mixture into each tart shell. Preheat oven to 400 ◦F. Position rack in lower third of oven. Bake tarts for 10 to 15 minutes until the edges are lightly brown. Move the baking sheet to the second rack counting from the top. Reduce the heat to 350 ◦F, once the custard being puffed up a bit, pull the oven door open about 2 to 3 inches. Bake for another 10 to 15 minutes until the custard is cooked through. To check doneness of the custards, insert a toothpick into the center of the custard. It’s cooked if the toothpick is clean.